American orbital launch vehicle. Von Braun launch vehicle known as 'Cluster's Last Stand' - 8 Redstone tanks around a Jupiter tank core, powered by eight Jupiter engines. Originally intended as the launch vehicle for Apollo manned circumlunar flights. However it was developed so early, no payloads were available for it. AKA: Juno V;Saturn C-1. Status: Retired 1975. First Launch: 1963-03-28. 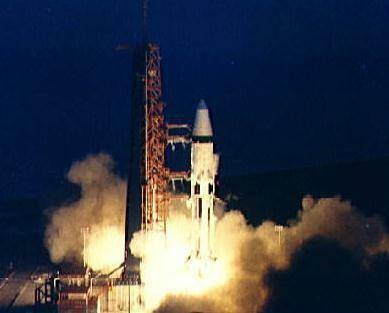 Last Launch: 1965-07-30. Number: 7 . Payload: 9,000 kg (19,800 lb). Thrust: 6,690.00 kN (1,503,970 lbf). Gross mass: 509,660 kg (1,123,600 lb). Height: 55.00 m (180.00 ft). Diameter: 6.52 m (21.39 ft). Apogee: 185 km (114 mi). The Saturn launch vehicle was the penultimate expression of the Peenemuende Rocket Team's designs for manned exploration of the moon and Mars. The designs were continuously developed and improved, starting from the World War II A11 and A12 satellite and manned shuttle launcher, through the designs made public in the Collier's Magazine series of the early 1950's, until the shock of the first Sputnik launch brought sudden real interest from the U.S. government. On December 30 1957 Von Braun produced a 'Proposal for a National Integrated Missile and Space Vehicle Development Plan'. This had the first mention of a 1,500,000 lbf booster (Juno V, later Saturn I). 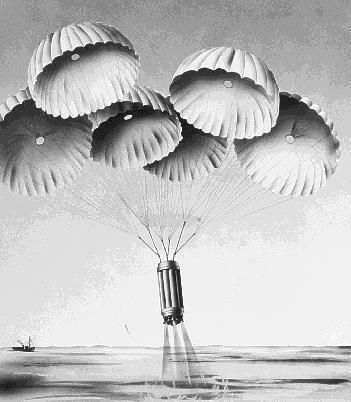 By July of the following year Huntsville had in hand the contract from ARPA to proceed with design of the Juno V.
Following transfer of the Peenemuende Rocket Team from the US Army to NASA, a year after the first plan was mooted, Von Braun briefed NASA on plans for booster development at Huntsville with objective of manned lunar landing. It was initially proposed that 15 Juno V (Saturn I) boosters assemble a 200,000 kg payload in earth orbit for direct landing on moon. NASA produced two months later, on February 15, 1959, its plan for development in the next decade of Vega (later cancelled after NASA discovered the USAF was secretly developing the similar Hustler (Agena) upper stage), Centaur, Saturn, and Nova launch vehicles (Juno V renamed Saturn I at this point). Throughout the initial planning, Presidential decision, and landing mode debate for the Apollo lunar landing goal, a variety of Saturn and Nova configurations were considered. Of these, only the C-1 and C-5 were taken through to further development. We had gone through the whole process of selecting upper stages and had made our recommendations to ARPA. We had indicated very clearly that we were willing to accept either the Atlas or Titan as the basis for building the second stage. 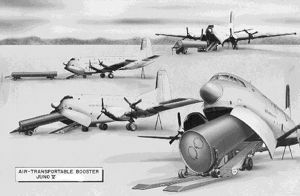 The real difference was that in one case we would be using the Atlas engines and associated equipment, built by North American, while in the other case, we would be using the Titan power plant built by Aerojet. Largely because of the multitude of different projects that had been saddled on the Atlas, we favor the Titan. Convair builds the Atlas, and we had great confidence in Convair's engineering, but this was over shadowed in our mind by the practical difficulties of getting enough Atlas hardware. However, we assured ARPA that we would take either one. We finally got a decision. - - We were told that we could begin designing the complete vehicle along the lines that we had recommended, namely, with the Titan as the basis for the second stage. So far there was no sign of trouble. Remembering the difficulties that we had had in connection with our requirements for North American engines for Jupiter, with the North American people largely under control of the Air Force, we knew that if we were to get on with the job properly we had to make our contract direct with Martin for the second stage work, and with the Convair-Pratt & Whitney group for the adaptation of Centaur to the third stage. We asked the Air Force for clearance to negotiate these matters with the companies concerned The Air Force (BMD) refused, and insisted that we let them handle all areas with the contractor. They used the old argument that they as a group could handle the responsibility much better, and that if they didn't handle it, there were bound to be priority problems connected with the military programs for Titan and others. We knew that the Air Force had no technical capacity of their own to put into this project, and that if we gave them the whole job, they would be forced to use the Ramo-Wooldridge organization, now known as the Space Technology Laboratories, as their contract agent to exercise technical supervision and co-ordination. While we knew and respected a few good men in STL, we felt we had ample cause to lack confidence in the organization as such. As a matter of fact, when the House Committee on Government Operations looked askance at STL with respect to their position as a profit-making organization, some of the best men had left the organization. We threw this one out on the table and said that we would not, under any circumstances, tolerate the interference of STL in this project. We knew that we had all the technical capability that was needed to supervise the overall system, and could not stand the delays and arguments that would most assuredly result were that organization to be thrown in also. Both sides presented their arguments to ARPA�Mr. Roy Johnson ruled that we could go ahead and contract directly Martin and others as required. It is understandable that the Air Force took this decision with poor grace. It represented a major setback to the system of absolute control over their own contractors, no matter for whom those contractors happened to be doing work. It also left them pretty much on the side- lines with respect to major participation in or control over any portion of the Saturn as a space vehicle. In the event, neither the Saturn A-1 or the Titan C went ahead. After several twists and turns, the Saturn I with the 160-inch upper stage was developed, the second production lot even being configured for Dynasoar. However Dynasoar was finally slated to fly on the Titan 3C, a third alternative in the USAF SLV-4 competition of 1961. Dynasoar in turn was cancelled, and the Saturn I was superseded by the Saturn IB for manned earth-orbit Apollo flights. Only the Titan 3C and its descendants would soldier on into the 21st Century, as the heavy-lift mainstay of American expendable boosters. Developments of the Saturn IB launch vehicle were detailed in some depth in the late 1960's. 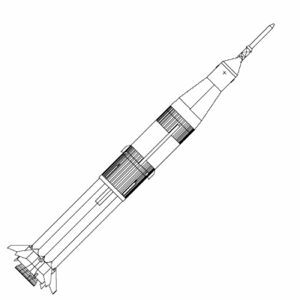 There was a large payload gap between the Saturn IB's 19,000 kg low-earth orbit capacity and the two-stage Saturn V 100,000 kg capability. How to fill it was the result of an exhaustive series of Marshall and contractor trade studies. The configurations shown were the most promising. The best solution was to add two or four UA1205 five segment solid rocket motors already developed for the Titan launch vehicle. This would boost payload to 40,000 kg. Use of seven segment motors developed for Titan 3M would bring the payload up to 48,000 kg but would require stretching the S-1B first stage by 20 feet. A more modest ten foot stretch, with Minuteman first stage motors for thrust augmentation, would bring a modest payload improvement to 23,000 kg. In the end, no further orders for Saturns were placed. Of the 12 Saturn IB's built, only nine were flown, the remaining three becoming NASA museum pieces. 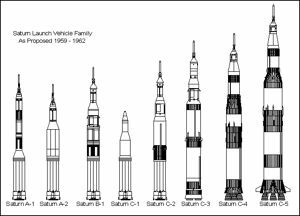 If Saturn production had continued, it is likely the Saturn IB would have been discontinued anyway, and Saturn II variants would have been used for any intermediate payload requirements. LEO Payload: 9,000 kg (19,800 lb) to a 185 km orbit at 28.00 degrees. Payload: 2,200 kg (4,800 lb) to a translunar trajectory. Development Cost $: 838.100 million. Launch Price $: 76.000 million in 1963 dollars in 1967 dollars. Stage 1. 1 x Saturn I. Gross Mass: 432,681 kg (953,898 lb). Empty Mass: 45,267 kg (99,796 lb). Thrust (vac): 7,582.100 kN (1,704,524 lbf). Isp: 289 sec. Burn time: 150 sec. Isp(sl): 255 sec. Diameter: 6.52 m (21.39 ft). Span: 6.52 m (21.39 ft). Length: 24.48 m (80.31 ft). Propellants: Lox/Kerosene. No Engines: 8. Engine: H-1. Status: Out of Production. Stage 2. 1 x Saturn IV. Gross Mass: 50,576 kg (111,500 lb). Empty Mass: 5,217 kg (11,501 lb). Thrust (vac): 400.346 kN (90,001 lbf). Isp: 410 sec. Burn time: 482 sec. Diameter: 5.49 m (18.01 ft). Span: 5.49 m (18.01 ft). Length: 12.19 m (39.99 ft). Propellants: Lox/LH2. No Engines: 6. Engine: RL-10. Status: Out of Production. Stage 3. 1 x Centaur C. Gross Mass: 15,600 kg (34,300 lb). Empty Mass: 1,996 kg (4,400 lb). Thrust (vac): 133.448 kN (30,000 lbf). Isp: 425 sec. Burn time: 430 sec. Diameter: 3.05 m (10.00 ft). Span: 3.05 m (10.00 ft). Length: 9.14 m (29.98 ft). Propellants: Lox/LH2. No Engines: 2. Engine: RL-10A-1. Status: Out of Production. Juno V-A American orbital launch vehicle. 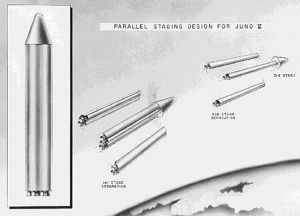 By 1958 the Super-Jupiter was called Juno V and the 4 E-1 engines were abandoned in favor of clustering 8 Jupiter IRBM engines below existing Redstone/Jupiter tankage. The A version had a Titan I ICBM as the upper stages. Masses, payload estimated. Juno V-B American orbital launch vehicle. A proposed version of the Juno V for lunar and planetary missions used a Titan I ICBM first stage and a Centaur high-energy third stage atop the basic Juno V cluster. Masses, payload estimated. Saturn A-2 American orbital launch vehicle. More powerful version of Saturn I with low energy second stage consisting of cluster of four IRBM motors and tankage, Centaur third stage. Masses, payload estimated. Saturn B-1 American orbital launch vehicle. Most powerful version of Saturn I considered. New low energy second stage with four H-1 engines, S-IV third stage, Centaur fourth stage. Masses, payload estimated. Saturn C-1 American orbital launch vehicle. Original flight version with dummy upper stages, including dummy Saturn S-V/Centaur (never flown). Saturn C-2 American orbital launch vehicle. The launch vehicle initially considered for realizing the Apollo lunar landing at the earliest possible date. 15 launches and rendezvous required to assemble direct landing spacecraft in earth orbit. Saturn I Blk2 American orbital launch vehicle. Second Block of Saturn I, with substantially redesigned first stage and large fins to accommodate Dynasoar payload. Saturn I RIFT American nuclear orbital launch vehicle. In the first half of the 1960's it was planned to make suborbital tests of nuclear propulsion for upper stages using a Saturn IB first stage to boost a Rover-reactor powered second stage on a suborbital trajectory. The second stage would impact the Atlantic Ocean down range from Cape Canaveral. Saturn IB American orbital launch vehicle. Improved Saturn I, with uprated first stage and Saturn IVB second stage (common with Saturn V) replacing Saturn IV. Used for earth orbit flight tests of Apollo CSM and LM. Saturn IB-A American orbital launch vehicle. Douglas Studies, 1965: S-IB with 225 k lbf H-1's; S-IVB stretched with 350,000 lbs propellants; Centaur third stage. Saturn IB-B American orbital launch vehicle. Douglas Studies, 1965: S-IB with 225 k lbf H-1's; S-IVB stretched with 350,000 lbs propellants and HG-3 high performance engine. Saturn IB-C American orbital launch vehicle. Douglas Studies, 1965: 4 Minuteman strap-ons; standard S-IB, S-IVB stages. Saturn IB-CE American orbital launch vehicle. Douglas Studies, 1965: Standard Saturn IB with Centaur upper stage. Saturn IB-D American orbital launch vehicle. Douglas Studies, 1965: Standard Saturn IB with Titan UA1205 5-segment strap-on motors. Saturn INT-05 American orbital launch vehicle. NASA Study, 1965: Half length 260 inch solid motor with S-IVB upper stage. Saturn INT-05A American orbital launch vehicle. UA Study, 1965: Full length 260 inch solid motor with S-IVB upper stage. Saturn INT-11 American orbital launch vehicle. Chrysler Studies, 1966: S-IB with 4 Titan UA1205 with standard S-IB stage, S-IVB stage, or 4 Titan UA1207 strap-ons with 20-foot stretched S-IB stage, S-IVB stage. S-IB ignition at altitude. Saturn INT-12 American orbital launch vehicle. Chrysler Studies, 1966: S-IB with only 4 H-1 motors, with 4 Titan UA1205 with standard length S-IB stage, S-IVB stage, or 4 Titan UA1207 strap-ons with 20-foot stretched S-IB stage, S-IVB stage. S-IB ignition at sea level at same time as strap-ons. Saturn INT-13 American orbital launch vehicle. Chrysler Studies, 1966: S-IB with 2 Titan UA1205 with standard length S-IB stage, S-IVB stage, or 2 Titan UA1207 strap-ons with 20-foot stretched S-IB stage, S-IVB stage. S-IB ignition at sea level at same time as strap-ons. Saturn INT-14 American orbital launch vehicle. Chrysler Studies, 1966: S-IB with 4 Minuteman motors as strap-ons, with no, 10, or 20-foot stretch S-IB stages, S-IVB stage. S-IB ignition at sea level at same time as strap-ons. Saturn INT-15 American orbital launch vehicle. Chrysler Studies, 1966: S-IB with 8 Minuteman motors as strap-ons, with no, 10, or 20-foot stretch S-IB stages, S-IVB stage. S-IB ignition at sea level at same time as strap-ons. Saturn INT-16 American orbital launch vehicle. 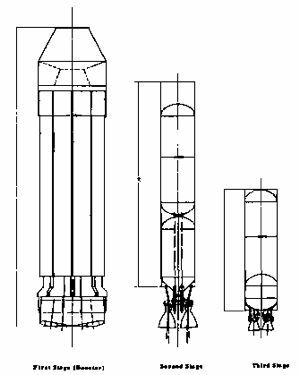 UA Studies, 1966: S-IVB upper stage with from 2 to 5 Titan UA1205, 1206, or 1207 motors as first stage, clustered around from 1 to 3 of the same motors as a second stage. S-IVB upper stage. Saturn INT-27 American orbital launch vehicle. UA study, 1965. Saturn variant using various combinations of 156 inch rocket motors as first and second stages, with S-IVB upper stage. Saturn LCB-Alumizine-140 American orbital launch vehicle. Boeing Low-Cost Saturn Derivative Study, 1967 (trade study of 260 inch first stages for S-IVB, all delivering 86,000 lb payload to LEO): Low Cost Booster, Single Pressure-fed N2O4/Alumizine Propellant engine, HY-140 Steel Hull. Saturn LCB-Alumizine-250 American orbital launch vehicle. Boeing Low-Cost Saturn Derivative Study, 1967 (trade study of 260 inch first stages for S-IVB, all delivering 86,000 lb payload to LEO): Low Cost Booster, Single Pressure-fed N2O4/Alumizine Propellant engine, Ni-250 Steel Hull. Saturn LCB-Lox/RP-1 American orbital launch vehicle. Boeing Low-Cost Saturn Derivative Study, 1967 (trade study of 260 inch first stages for S-IVB, all delivering 86,000 lb payload to LEO): Low Cost Booster, Single Pressure-fed LOx/RFP-1 engine. Saturn LCB-SR American orbital launch vehicle. Boeing Low-Cost Saturn Derivative Study, 1967 (trade study of 260 inch first stages for S-IVB, all delivering 86,000 lb payload to LEO): Low Cost Booster, 260 inch solid motor, full length. Saturn LCB-Storable-250 American orbital launch vehicle. Boeing Low-Cost Saturn Derivative Study, 1967 (trade study of 260 inch first stages for S-IVB, all delivering 86,000 lb payload to LEO): Low Cost Booster, Single Pressure-fed N2O4/UDMH Propellant engine, Ni-250 Steel Hull. Super-Jupiter American orbital launch vehicle. The very first design that would lead to Saturn. A 1.5 million pound thrust booster using four E-1 engines - initial consideration of using a single USAF F-1 engine abandoned because of development time. Existing missile tankage was clustered above the engines. Uprated Saturn I American orbital launch vehicle. Initial version of Saturn IB with old-design Saturn IB first stage. Family: orbital launch vehicle. People: von Braun. Country: USA. Engines: H-1 engine, RL-10A-1, RL-10. Spacecraft: Apollo Lunar Landing, Horizon Lunar Outpost, Mercury, Horizon Station, Ideal Home Station, Horizon LERV, Apollo LM, Apollo CSM, Apollo A, Apollo X, Highwater, Lunar Bus, MORL, Apollo D-2, Apollo L-2C, Apollo Lenticular, Surveyor, Dynasoar, Apollo CSM Block I, Jupiter nose cone, Gemini - Saturn I, Gemini - Saturn IB, Pegasus satellite, Apollo LM Lab, Apollo Experiments Pallet, Gemini Observatory, Apollo RM, Big Gemini, Apollo Rescue CSM, Skylab, Apollo ASTP Docking Module. Projects: Apollo. Launch Sites: Cape Canaveral, Cape Canaveral LC34, Cape Canaveral LC37B. Stages: Saturn IV, Centaur C, S-I stage. Bibliography: 16, 17, 18, 2, 216, 22, 222, 228, 231, 232, 234, 26, 27, 279, 33, 376, 45, 452, 47, 6, 60, 86. As conceived for Project Horizon, 1958. The Juno-5 was designed to be air-transportable and assembled at austere launch pads. A parallel staging scheme was considered for the Juno-5. This would have resulted in a vehicle similar to the Russian R-7 launcher. Full recovery and reuse of the Juno-5 was planned. The structural provisions were retained in the earliest Saturn I test vehicles, but never used. The very first Juno-5 test article firing on the stand at the Redstone Arsenal. 1957 July 29 - . LV Family: Titan, Saturn I, . Follow-on ballistic missiles and space programs - . AFBMD presented the Air Force Scientific Advisory Board's Ad Hoc Committee with a summary of follow-on ballistic missile weapon systems and advanced space programs that could be undertaken. Included among the programs was the proposed development of high-thrust space vehicles for orbital and lunar flights. 1957 December 10 - . Launch Vehicle: Saturn I. National Integrated Missile and Space Vehicle Development Program - . Nation: USA. Program: Horizon. The Army Ballistic Missile Agency completed and forwarded to higher authority the first edition of A National Integrated Missile and Space Vehicle Development Program , which had been in preparation since April 1957. Included was a "short-cut development program" for large payload capabilities, covering the clustered-engine booster of 1.5 million pounds of thrust to be operational in 1963. The total development cost of $850 million during the years 1958-1963 covered 30 research and development flights, some carrying manned and unmanned space payloads. One of six conclusions given in the document was that "Development of the large (1520 K-pounds thrust) booster is considered the key to space exploration and warfare." Later vehicles with greater thrust were also described. 1958 - . LV Family: Saturn I. Launch Vehicle: Juno V-A. Juno V heavy space launch design - . Nation: USA. The Von Braun team's Super-Jupiter evolved into the Juno V. The 4 E-1 engines were abandoned in favor of clustering 8 Jupiter IRBM engines below existing Redstone/Jupiter tankage..
1958 September 11 - . Launch Vehicle: Saturn I. Letter contract for the development of the Saturn H-1 rocket engine - . Nation: USA. Program: Apollo. A letter contract was signed by NASA with NAA's Rocketdyne Division for the development of the H-1 rocket engine, designed for use in a clustered-engine booster..
1958 October 11 - . Launch Vehicle: Saturn I. Contract for development of the H-1 engine - . Nation: USA. Program: Apollo. Pioneer I, intended as a lunar probe, was launched by a Thor-Able rocket from the Atlantic Missile Range, with the Air Force acting as executive agent to NASA. The 39-pound instrumented payload did not reach escape velocity..
Saturn H-1 engine first full-power firing - . Nation: USA. Program: Apollo. The H-1 engine successfully completed its first full-power firing at NAA's Rocketdyne facility in Canoga Park, Calif..
1959 April 15 - . LV Family: Saturn I. Launch Vehicle: Saturn A-1. Use of Titan for Saturn upper stages - . Nation: USA. Program: Apollo. 1959 May 3 - . Launch Vehicle: Saturn I. First H-1 engine for the Saturn delivered - . Nation: USA. Program: Apollo. The first Rocketdyne H-1 engine for the Saturn arrived at the Army Ballistic Missile Agency (ABMA ). The H-1 engine was installed in the ABMA test stand on May 7, first test-fired on May 21, and fired for 80 seconds on May 29. The first long-duration firing - 151.03 seconds - was on June 2. 1959 May 25-26 - . LV Family: Saturn I. Launch Vehicle: Saturn C-2. National booster program, Dyna-Soar, and Mercury discussed - . Nation: USA. Related Persons: Faget, Low, George. Program: Apollo. Spacecraft: Mercury. Adopt the lunar landing mission as its long-range objective. Investigate vehicle staging so that Saturn could be used for manned lunar landings without complete reliance on Nova. Make a study of whether parachute or airport landing techniques should be emphasized. Consider nuclear rocket propulsion possibilities for space flight. Attach importance to research on auxiliary power plants such as hydrogen-oxygen systems. 1959 May 26 - . Launch Vehicle: Saturn I. First H-1 engine for Saturn I fired. - . Nation: USA. Program: Apollo. ABMA static fired a single H-1 Saturn engine at Redstone Arsenal, Ala..
1959 June 5 - . Launch Site: Cape Canaveral. Launch Complex: Cape Canaveral. 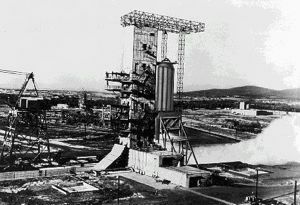 Launch Vehicle: Saturn I.
Saturn I launch complex construction starts. - . Nation: USA. Program: Apollo. 1959 December 9 - . LV Family: Saturn I. Launch Vehicle: Saturn C-2. Goett Committee - . Nation: USA. Program: Apollo. Class: Manned. Type: Manned space station. Committee formed to recommend post-Mercury space program. After four meetings, and studying earth-orbit assembly using Saturn II or direct ascent using Nova, tended to back development of Nova..
1960 February 1 - . LV Family: Saturn I. Launch Vehicle: Saturn C-2. Lunar Exploration Program Based Upon Saturn Systems - . Nation: USA. Program: Apollo. The Army Ballistic Missile Agency submitted to NASA the study entitled "A Lunar Exploration Program Based Upon Saturn-Boosted Systems." In addition to the subjects specified in the preliminary report of October 1, 1959, it included manned lunar landings. 1960 February 29 - . Launch Vehicle: Saturn I.
Eleven companies submitted contract proposals for the Saturn second stage - . Nation: USA. Program: Apollo. Eleven companies submitted contract proposals for the Saturn second stage (S-IV): Bell Aircraft Corporation; The Boeing Airplane Company; Chrysler Corporation; General Dynamics Corporation, Convair Astronautics Division; Douglas Aircraft Company, Inc.; Grumman Aircraft Engineering Corporation; Lockheed Aircraft Corporation; The Martin Company; McDonnell Aircraft Corporation; North American Aviation, Inc.; and United Aircraft Corporation. 1960 March 28 - . Launch Vehicle: Saturn I. Two H-1's fired together. - . Nation: USA. Program: Apollo. Two of Saturn's first-stage engines passed initial static firing test of 7.83 seconds duration at Huntsville, Ala..
1960 April 1-May 3 - . LV Family: Saturn I. Launch Vehicle: Saturn C-2. Guidelines for an advanced manned spacecraft program presented by STG - . Nation: USA. Program: Apollo. Spacecraft: Apollo CSM, CSM ECS, CSM Source Selection. Members of STG presented guidelines for an advanced manned spacecraft program to NASA Centers to enlist research assistance in formulating spacecraft and mission design. To open these discussions, Director Robert R. Gilruth summarized the guidelines: manned lunar reconnaissance with a lunar mission module, corollary earth orbital missions with a lunar mission module and with a space laboratory, compatibility with the Saturn C-1 or C-2 boosters (weight not to exceed 15,000 pounds for a complete lunar spacecraft and 25,000 pounds for an earth orbiting spacecraft), 14-day flight time, safe recovery from aborts, ground and water landing and avoidance of local hazards, point (ten square-mile) landing, 72-hour postlanding survival period, auxiliary propulsion for maneuvering in space, a "shirtsleeve" environment, a three-man crew, radiation protection, primary command of mission on board, and expanded communications and tracking facilities. In addition, a tentative time schedule was included, projecting multiman earth orbit qualification flights beginning near the end of the first quarter of calendar year 1966. Guidelines for the advanced manned spacecraft program - . Nation: USA. Program: Apollo. The spacecraft should be capable ultimately of manned circumlunar reconnaissance. As a logical intermediate step toward future goals of lunar and planetary landing many of the problems associated with manned circumlunar flight would need to be solved. The lunar spacecraft should be capable of earth orbit missions for initial evaluation and training. The reentry component of this spacecraft should be capable of missions in conjunction with space laboratories or space stations. To accomplish lunar reconnaissance before a manned landing, it would be desirable to approach the moon closer than several thousand miles. Fifty miles appeared to be a reasonable first target for study purposes. The spacecraft should be designed to be compatible with the Saturn C-1 or C-2 boosters for the lunar mission. The multiman advanced spacecraft should not weigh more than 15,000 pounds including auxiliary propulsion and attaching structure. A flight-time capability of the spacecraft for 14 days without resupply should be possible. Considerable study of storage batteries, fuel cells, auxiliary power units, and solar batteries would be necessary. Items considered included the percentage of the power units to be placed in the "caboose" (space laboratory), preference for the use of storage batteries for both power and radiation shielding, and redundancy for reliability by using two different types of systems versus two of the same system. 1960 April 6 - . Launch Vehicle: Saturn I. Four H-1's fired together. - . Nation: USA. Program: Apollo. Four of the eight H-1 engines of the Saturn C-1 first-stage booster were successfully static-fired at Redstone Arsenal for seven seconds..
1960 April 26 - . Launch Vehicle: Saturn I.
Douglas to build the second stage (S-IV) of the Saturn C-1 - . Nation: USA. Program: Apollo. NASA announced the selection of the Douglas Aircraft Company to build the second stage (S-IV) of the Saturn C-1 launch vehicle..
1960 April 29 - . Launch Vehicle: Saturn I. All eight H-1 engines of the Saturn C-1 first stage ground-tested simultaneously - . Nation: USA. Program: Apollo. At Redstone Arsenal, all eight H-1 engines of the first stage of the Saturn C-1 launch vehicle were static-fired simultaneously for the first time and achieved 1.3 million pounds of thrust..
First public demonstration of the H-1 engine - . Nation: USA. Program: Apollo. 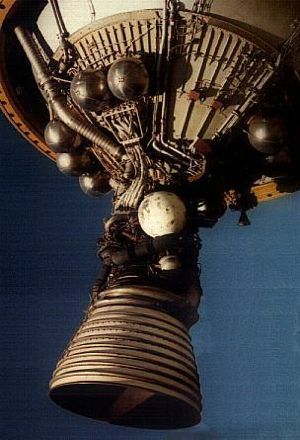 Eight H-1 engines of the first stage of the Saturn C-1 launch vehicle were static-fired for 35.16 seconds, producing 1.3 million pounds of thrust. This first public demonstration of the H-1 took place at Marshall Space Flight Center..
1960 June 8 - . Launch Vehicle: Saturn I. Full Saturn I engine cluster full duration test. - . Nation: USA. Program: Apollo. Complete eight-engine static firing of Saturn successfully conducted for 110 seconds at MSFC, the longest firing to date..
1960 July 14-15 - . LV Family: Saturn I. Launch Vehicle: Saturn C-2. Space Exploration Program Council - . Nation: USA. Program: Apollo. The third meeting of the Space Exploration Program Council was held at NASA Headquarters. The question of a speedup of Saturn C-2 production and the possibility of using nuclear upper stages with the Saturn booster were discussed. The Office of Launch Vehicle Programs would plan a study on the merits of using nuclear propulsion for some of NASA's more sophisticated missions. If the study substantiated such a need, the amount of in-house basic research could then be determined. 1960 September 30 - . LV Family: Saturn I. Launch Vehicle: Saturn C-2. Space Exploration Program Council - . Nation: USA. Related Persons: Low, George. Program: Apollo. 1960 December 13 - . Launch Site: Cape Canaveral. Launch Complex: Cape Canaveral. Launch Vehicle: Saturn I.
Saturn transport barge commissioned. - . Nation: USA. Program: Apollo. Palaemon, a 180-foot barge built to transport the Saturn launch vehicle from MSFC to Cape Canaveral by water, was formally accepted by MSFC Director from Maj. Gen. Frank S. Besson, Chief of Army Transportation..
1961 January 9 - . LV Family: Atlas, Saturn I, Titan. Launch Vehicle: Titan 3. USAF need for a space launch vehicle with 15,000 lb payload - . Headquarters USAF instructed AFBMD to continue its efforts to define the need for a space launch vehicle with a payload capacity between the Atlas/Centaur (9,000 lbs) and the early Saturn (19,000 lbs). 1961 March 7 - . Launch Vehicle: Saturn I. 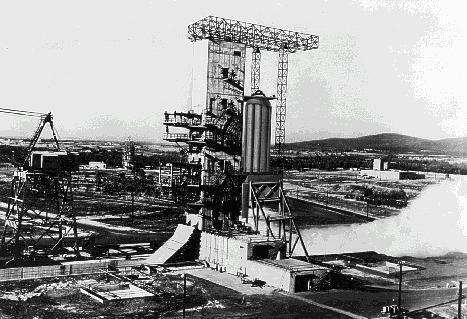 First flight Saturn I on test stand. - . Nation: USA. Program: Apollo. First flight model of Saturn booster (SA-1) installed on static test stand for preflight checkout, Marshall Space Flight Center, Huntsville..
1961 March 30 - . LV Family: Saturn I. Launch Vehicle: Saturn I RIFT. RIFT flight briefed to contractors. - . Nation: USA. Program: NERVA. Reactor-in-flight-test system (Rift) study, a part of the NASA-AEC program on nuclear rockets, was briefed by contractors at NASA headquarters..
1961 April 29 - . 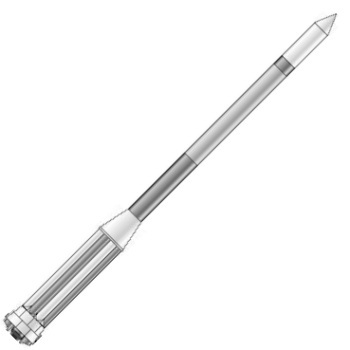 Launch Vehicle: Saturn I.
Saturn I fight qualification. - . Nation: USA. Program: Apollo. The first successful flight qualification test of the Saturn SA-1 booster took place in an eight-engine test lasting 30 seconds..
1961 May 2 - . LV Family: Saturn I. Launch Vehicle: Saturn C-2. Ad Hoc Task Group for a Manned Lunar Landing Study - . Nation: USA. Program: Apollo. All tasks associated with the mission. Interdependent time-phasing of the tasks. Areas requiring considerable technological advancements from the current state of the art. Tasks for which multiple approach solutions were advisable. Important action and decision points in the mission plan. A refined estimate by task and by fiscal year of the dollar resources required for the mission. Tentative in-house and contractor task assignments accompanying the dollar and manpower resource requirements. The manned lunar landing target date was 1967. Intermediate missions of multiman orbital satellites and manned circumlunar missions were desirable at the earliest possible time. Man's mission on the moon as it affected the study was to be determined by the Ad Hoc Task Group - i.e., the time to be spent on the lunar surface and the tasks to be performed while there. In establishing the mission plan, the use of the Saturn C-2 launch vehicle was to be evaluated as compared with an alternative launch vehicle having a higher thrust first stage and C-2 upper-stage components. The mission plan was to include parallel development of liquid and solid propulsion leading to a Nova vehicle 400,000 pounds in earth orbit and should indicate when the decision should be made on the final Nova configuration. Nuclear-powered launch vehicles should not be considered for use in the first manned lunar landing mission. The flight test program should be laid out with enough launchings to meet the needs of the program considering the reliability requirements. Alternative approaches should be provided in critical areas - e.g., upper stages and mission modes. The engineering sketch drawn by John D. Bird of Langley Research Center on May 3, 1961, indicated the thinking of that period: By launching two Saturn C-2's, the lunar landing mission could be accomplished by using both earth rendezvous and lunar rendezvous at various stages of the mission. 1961 May 8 - . Launch Vehicle: Saturn I.
S-IV satisfactory for Apollo missions - . Nation: USA. Program: Apollo. After study and discussion by STG and Marshal! Space Flight Center officials, STG concluded that the current 154-inch diameter of the second stage (S-IV) adapter for the Apollo spacecraft would be satisfactory for the Apollo missions on Saturn flights SA-7, SA-8, SA-9, and SA-10. 1961 June 2 - . Launch Site: Cape Canaveral. Launch Complex: Cape Canaveral. Launch Vehicle: Saturn I.
Saturn I transport route interdicted. - . Nation: USA. Program: Apollo. Collapse of a lock in the Wheeler Dam below Huntsville on the Tennessee River interdicted the planned water route of the first Saturn space booster from Marshall Space Flight Center to Cape Canaveral on the barge Palaemon..
1961 June 26 - . Launch Site: Cape Canaveral. Launch Complex: Cape Canaveral. Launch Vehicle: Saturn I.
Saturn I barge replacement. - . Nation: USA. Program: Apollo. A Navy YFNB barge was obtained by NASA to serve as a replacement for the Palaemon in transporting of the Saturn booster to Cape Canaveral..
1961 July 28 - . Launch Vehicle: Saturn I.
NASA invitation to bids for Apollo prime contract - . Nation: USA. Program: Apollo. 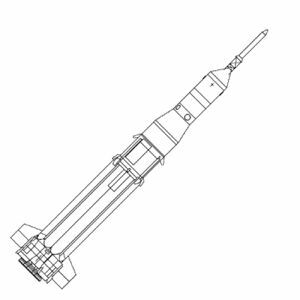 Spacecraft: Apollo CSM, CSM Original Specification, CSM Source Selection. 1961 Aug - . LV Family: Saturn I. Launch Vehicle: Saturn. The NASA-DoD Large Launch Vehicle Planning Group. - . The NASA-DoD Large Launch Vehicle Planning Group met to study policy management and requirements for launch vehicles up to the size of Saturn..
1961 October 27 - . 15:06 GMT - . Launch Site: Cape Canaveral. Launch Complex: Cape Canaveral LC34. LV Family: Saturn I. Launch Vehicle: Saturn C-1. Nation: USA. Agency: NASA. Apogee: 136 km (84 mi). Largest known rocket launch to date, the Saturn I 1st stage booster, successful on first test flight from Atlantic Missile Range. With its eight clustered engines developing almost 1.3 million pounds of thrust at launch, the Saturn (SA-1) hurled waterfilled dummy upper stages to an altitude of 84.8 miles and 214.7 miles down range. In a postlaunch statement, Administrator Webb said: "The flight today was a splendid demonstration of the strength of our national space program and an important milestone in the buildup of our national capacity to launch heavy payloads necessary to carry out the program projected by President Kennedy on May 25.". 1961 December 7 - . LV Family: Saturn I. Launch Vehicle: Saturn I RIFT. Kiwi B-1A tests completed. - . Nation: USA. Program: NERVA. Power run completed the test series on the Kiwi B-1A reactor system being conducted at the Nevada Test Site by AEC's Los Alamos Scientific Laboratory. Fourth in a series of test reactors in the joint AEC-NASA nuclear rocket propulsion program, Kiwi B-1A was disassembled for examination at the conclusion of the test runs. 1961 December 8 - . Launch Vehicle: Saturn I. Support service contractor selected for Michoud. - . Nation: USA. Program: Apollo. NASA selected Mason-Rust as the contractor to provide support services at NASA's Michoud plant near New Orleans, providing housekeeping services through June 30, 1962 for the three contractors who would produce the Saturn S-I and S-IB boosters and the Rift nuclear upper-stage vehicle. 1962 April 25 - . 14:00 GMT - . Launch Site: Cape Canaveral. Launch Complex: Cape Canaveral LC34. LV Family: Saturn I. Launch Vehicle: Saturn C-1. Nation: USA. Agency: NASA. Apogee: 145 km (90 mi). Second suborbital test of Saturn I. The Saturn SA-2 first stage booster was launched successfully from Cape Canaveral. The rocket was blown up intentionally and on schedule about 2.5 minutes after liftoff at an altitude of 65 miles, dumping the water ballast from the dummy second and third stages into the upper atmosphere. The experiment, Project Highwater, produced a massive ice cloud and lightning-like effects. The eight clustered H-1 engines in the first stage produced 1.3 million pounds of thrust and the maximum speed attained by the booster was 3,750 miles per hour. Modifications to decrease the slight fuel sloshing encountered near the end of the previous flight test were successful. 1962 November 16 - . 17:45 GMT - . Launch Site: Cape Canaveral. Launch Complex: Cape Canaveral LC34. LV Family: Saturn I. Launch Vehicle: Saturn C-1. Nation: USA. Agency: NASA. Apogee: 167 km (103 mi). Third suborbital test of Saturn I. Saturn-Apollo 3 (Saturn C-1, later called Saturn I) was launched from the Atlantic Missile Range. Upper stages of the launch vehicle were filled with 23000 gallons of water to simulate the weight of live stages. At its peak altitude of 167 kilometers (104 miles), four minutes 53 seconds after launch, the rocket was detonated by explosives upon command from earth. The water was released into the ionosphere, forming a massive cloud of ice particles several miles in diameter. By this experiment, known as "Project Highwater," scientists had hoped to obtain data on atmospheric physics, but poor telemetry made the results questionable. The flight was the third straight success for the Saturn C-1 and the first with maximum fuel on board. 1963 January 10 - . Launch Vehicle: Saturn I.
Unmanned Apollo spacecraft to be flown on Saturn C-1 - . Nation: USA. Program: Apollo. MSC and OMSF agreed that an unmanned Apollo spacecraft must be flown on the Saturn C-1 before a manned flight. SA-10 was scheduled to be the unmanned flight and SA-111, the first manned mission..
1963 February 20 - . Launch Vehicle: Saturn I.
Saturn engine-out capability investigated - . Nation: USA. Program: Apollo. At a meeting of the MSC-MSFC Flight Mechanics Panel, it was agreed that Marshall would investigate "engine-out" capability (i.e., the vehicle's performance should one of its engines fail) for use in abort studies or alternative missions. Not all Saturn I, IB, and V missions included this engine-out capability. Also, the panel decided that the launch escape system would be jettisoned ten seconds after S-IV ignition on Saturn I launch vehicles. 1963 March 6 - . Launch Vehicle: Saturn I. North American completed Apollo boilerplate (BP) 9 - . Nation: USA. Program: Apollo. Spacecraft: Apollo CSM, CSM LES. 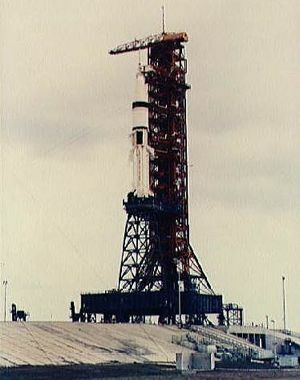 North American completed construction of Apollo boilerplate (BP) 9, consisting of launch escape tower and CSM. It was delivered to MSC on March 18, where dynamic testing on the vehicle began two days later. On April 8, BP-9 was sent to MSFC for compatibility tests with the Saturn I launch vehicle. 1963 March 13 - . Launch Vehicle: Saturn I. First long-duration static test of Saturn SA-5 first stage - . Nation: USA. Program: Apollo. The first stage of the Saturn SA-5 launch vehicle was static fired at MSFC for 144.44 seconds in the first long-duration test for a Block II S-1. 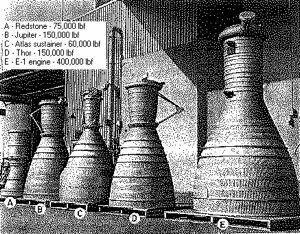 The cluster of eight H-1 engines produced 680 thousand kilograms (1.5 million pounds) of thrust. An analysis disclosed anomalies in the propulsion system. In a final qualification test two weeks later, when the engines were fired for 143.47 seconds, the propulsion problems had been corrected. 1963 March 28 - . 20:11 GMT - . Launch Site: Cape Canaveral. Launch Complex: Cape Canaveral LC34. Launch Vehicle: Saturn I. Nation: USA. Agency: NASA. Apogee: 129 km (80 mi). Fourth suborbital test of Saturn I. The S-I Saturn stage reached an altitude of 129 kilometers (80 statute miles) and a peak velocity of 5,906 kilometers (3,660 miles) per hour. This was the last of four successful tests for the first stage of the Saturn I vehicle. After 100 seconds of flight, No. 5 of the booster's eight engines was cut off by a preset timer. That engine's propellants were rerouted to the remaining seven, which continued to burn. This experiment confirmed the "engine-out" capability that MSFC engineers had designed into the Saturn I. 1963 April 17 - . LV Family: Saturn V, Saturn I, Titan. Large Solid Rocket Motor Program (Program 623A) begun. - . The Defense Department announced the selection of Thiokol Chemical Corporation, Aerojet-General Corporation, and Lockheed Propulsion Company to conduct work on the development of large solid-propellant motors as part of the Space Systems Division's Large Solid Rocket Motor Program (Program 623A). Development work was divided into four tasks: (1) Thiokol and Aerojet-General were to develop 260-inch diameter, solid rocket motors of 3 million pounds of thrust for demonstration static firings; (2) Thiokol was to work on a 156-inch, 3 million-pound thrust, two-segment solid rocket motor; (3) Thiokol was to develop and static fire a 156-inch, one-segment solid rocket motor of one million pounds thrust demonstrating thrust vector control (TVC) through movable nozzles; and (4) Lockheed was to static fire a 156-inch, single segment solid rocket motor of one million pounds thrust that demonstrated TVC through jet tabs. 1963 August 5 - . Launch Vehicle: Saturn I. First static firing test of Saturn S-IV stage for SA-5 - . Nation: USA. Program: Apollo. 1963 September 16 - . 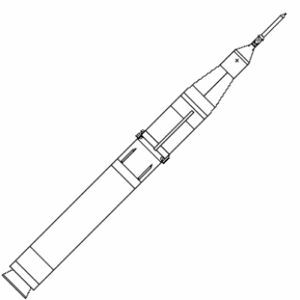 Launch Vehicle: Saturn I.
Apollo launch escape system modified - . Nation: USA. Program: Apollo. The launch escape system was modified so that, under normal flight conditions, the crew could jettison the tower. On unmanned Saturn I flights, tower jettison was initiated by a signal from the instrument unit of the S-IV (second) stage..
1964 February 6 - . Launch Vehicle: Saturn I.
American challenge - . Nation: Russia. Related Persons: Popovich, Tereshkova. Program: Lunar L1. 1964 September 30 - . LV Family: Saturn I. Second test firing of a 156-inch diameter, solid-propellant motor. - . In a second test firing, Lockheed Propulsion Company fired a 156-inch diameter, solid-propellant motor (156-4-L) for 140 seconds, and it produced over one million pounds of thrust..
1964 December 12 - . LV Family: Saturn I. First 156-inch solid rocket motor fired - . Thiokol Chemical Corporation's Wasatch Division fired its first 156-inch, one-segment, solid rocket motor (156-1-T) with gimballed nozzle thrust vector control. The motor produced approximately 1.3 million pounds of thrust for two minutes. This was the third test firing of a 156-inch solid rocket motor in Space Systems Division's Large Solid Rocket Motor Program (Program 623A). Pegasus 1 - . Payload: Pegasus 1. Mass: 10,400 kg (22,900 lb). Nation: USA. Agency: NASA Huntsville. Program: Apollo. Class: Earth. Type: Micrometeoroid satellite. Spacecraft: Pegasus satellite. Decay Date: 1978-09-17 . USAF Sat Cat: 1085 . COSPAR: 1965-009A. Apogee: 726 km (451 mi). Perigee: 510 km (310 mi). Inclination: 31.70 deg. Period: 97.00 min. 1965 February 25 - . Launch Vehicle: Saturn I.
Chrysler contract for support services for the Saturn I and IB launch programs modified - . Nation: USA. Program: Apollo. KSC supplemented Chrysler Corporation's contract for support services for the Saturn I and IB launch programs. Effective through June 30, 1968, the agreement would cost NASA $41 million plus an award fee..
1965 February 27 - . 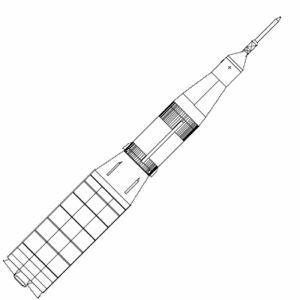 LV Family: Saturn V, Saturn I.
Static-fireing of a two-segment, 156-inch diameter, 100-foot long solid-propellant rocket motor - . The Thiokol Chemical Corporation (Brunswick Division) static-fired a two-segment, 156-inch diameter, 100-foot long solid-propellant rocket motor (156-2-T). This 900,000-pound motor, the largest solid-propellant motor yet fired, generated over three million pounds of thrust for one minute, more than twice as much as any previous motor. This test firing was intended to validate design criteria for the 260-inch motor program that was officially transferred from Space Systems Division management to that of NASA's Lewis Research Center (LeRC) on 1 March. 1965 March 31 - . Launch Vehicle: Saturn I.
Apollo LEMs 1, 2, and 3 to have remote command of the transponder feature - . Nation: USA. Program: Apollo. Spacecraft: Apollo LM, LM Communications. MSC requested that Grumman incorporate in the command list for LEMs 1, 2, and 3 the capability for turning the LEM transponder off and on by real-time radio command from the Manned Space Flight Network. Necessity for capability of radio command for turning the LEM transponder on after LEM separation resulted from ASPO's decision that the LEM and Saturn instrument unit S-band transponders would use the same transmission and reception frequencies. Pegasus 2 - . Payload: Pegasus 2. Mass: 10,464 kg (23,069 lb). Nation: USA. Agency: NASA Huntsville. Program: Apollo. Class: Earth. Type: Micrometeoroid satellite. Spacecraft: Pegasus satellite. Decay Date: 1979-11-03 . USAF Sat Cat: 1381 . COSPAR: 1965-039A. Apogee: 740 km (450 mi). Perigee: 502 km (311 mi). Inclination: 31.70 deg. Period: 97.00 min. Pegasus 2 was a meteoroid detection satellite. The Saturn I launch vehicle (SA-8) placed the spacecraft, protected by a boilerplate CSM (BP-26), into a 740-by-509-km (460-by-316-mi) orbit. Once in orbit, the dummy CSM was jettisoned. Pegasus 2, still attached to the second stage of the launch vehicle, then deployed its 29-m (96-ft) winglike panels. Within several hours, the device began registering meteoroid hits. Pegasus 3 - . Payload: Pegasus 3. Mass: 10,500 kg (23,100 lb). Nation: USA. Agency: NASA Huntsville. Program: Apollo. Class: Earth. Type: Micrometeoroid satellite. Spacecraft: Pegasus satellite. Decay Date: 1969-08-04 . USAF Sat Cat: 1467 . COSPAR: 1965-060A. Apogee: 449 km (278 mi). Perigee: 441 km (274 mi). Inclination: 28.90 deg. Period: 93.40 min. NASA launched Pegasus 3 , third of the meteoroid detection satellites, as scheduled at 8:00 a.m. EST, from Cape Kennedy. As earlier, an Apollo spacecraft (boilerplate 9) served as the payload's shroud. This flight (SA-10) marked the end of the Saturn I program, which during its seven-year lifetime had achieved 10 straight successful launches and had contributed immeasurably to American rocket technology. 1965 December 14 - . LV Family: Saturn I. Firing of the first flight-weight, 156-inch diameter, solid-propellant rocket motor - . Lockheed Propulsion Company test fired the first flight-weight, 156-inch diameter, solid-propellant rocket motor (156-5-L) of three million pounds of thrust. This was the fifth 156-inch motor test fired in the program, and the third Lockheed motor..
1966 January 15 - . LV Family: Saturn I.
Lockheed Propulsion Company fired its fourth 156-inch diameter, solid-propellant rocket motor. - . Motor 156-6-L was a monolithic motor with a high burn rate propellant and submerged nozzle. During its one minute test firing, the motor generated over three million pounds of thrust. This was the sixth test firing in Space Systems Division's Large Solid Rocket Motor Program (Program 623A). 1966 July 5 - . 14:53 GMT - . Launch Site: Cape Canaveral. Launch Complex: Cape Canaveral LC37B. LV Family: Saturn I. Launch Vehicle: Uprated Saturn I.
Apollo 203 - . Payload: Saturn S-IVB-203. Mass: 26,500 kg (58,400 lb). Nation: USA. Agency: NASA Huntsville. Program: Apollo. Decay Date: 1966-07-05 . USAF Sat Cat: 2289 . COSPAR: 1966-059A. Apogee: 212 km (131 mi). Perigee: 183 km (113 mi). Inclination: 31.90 deg. Period: 88.50 min. First orbital test Saturn IB; no spacecraft. 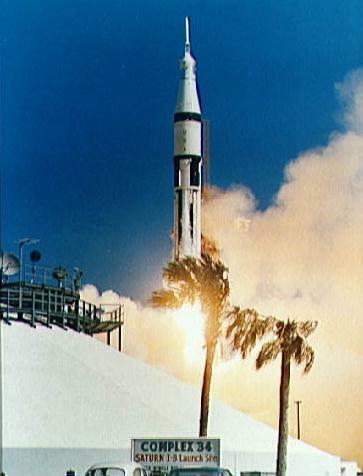 AS-203 lifted off from Launch Complex 37, Eastern Test Range, at 10:53 a.m. EDT in the second of three Apollo-Saturn missions scheduled before manned flight in the Apollo program. All objectives - to acquire flight data on the S-IVB stage and instrument unit - were achieved. The uprated Saturn I - consisting of an S-IB stage, S-IVB stage, and an instrument unit - boosted an unmanned payload into an original orbit of 185 by 189 kilometers. The inboard engine cutoff of the first stage occurred after 2 minutes 18 seconds of flight and the outboard engine cutoff was 4 seconds later. The S-IVB engine burned 4 minutes 50 seconds. No recovery was planned and the payload was expected to enter the earth's atmosphere after about four days. 1966 August 1 - . Launch Vehicle: Saturn I.
Chrysler uprated Saturn I first-stage production contract changed - . Nation: USA. Program: Apollo. NASA signed a supplemental agreement with Chrysler Corp.'s Space Division at New Orleans, La., converting the uprated Saturn I first-stage production contract from cost-plus-fixed-fee to cost-plus-incentive-fee. Under the agreement, valued at $339 million, the amount of the contractor's fee would be based on ability to perform assigned tasks satisfactorily and meet prescribed costs and schedules. The contract called for Chrysler to manufacture, assemble and test 12 uprated Saturn I first stages and provide system engineering, integration support, ground support equipment, and launch services. 1966 August 25 - . 17:15 GMT - . Launch Site: Cape Canaveral. Launch Complex: Cape Canaveral LC34. LV Family: Saturn I. 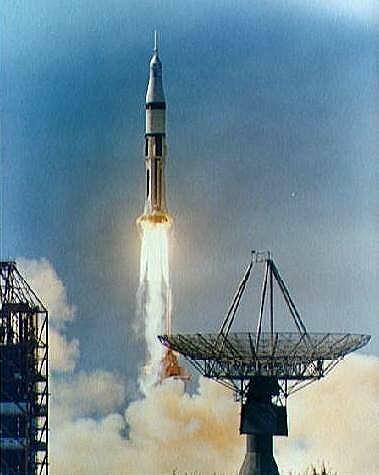 Launch Vehicle: Uprated Saturn I.
Apollo 202 (AS-202) - . Nation: USA. Agency: NASA. Apogee: 1,143 km (710 mi). Spacecraft 011 was essentially a Block I spacecraft with the following exceptions: couches, crew equipment, and the cabin postlanding ventilation were omitted; and three auxiliary batteries, a mission control programmer, four cameras, and flight qualification instrumentation were added. Of six primary test objectives assigned to the mission, the objectives for the environmental control, electrical power, and communications subsystems were not completely satisfied. All other spacecraft test objectives were successfully accomplished. 1967 May 26 - . LV Family: Saturn I.
Ninth 156-inch diameter, solid-propellant motor in Large Solid Rocket Motor Program fired. - . Thiokol Chemical Corporation's Wasatch Division test fired the ninth 156-inch diameter, solid-propellant motor in Space Systems Division's Large Solid Rocket Motor Program (Program 623A). Motor 156-9-T demonstrated a flexible seal thrust vector control system while generating more than one million pounds of thrust for one minute. 1968 June 25 - . LV Family: Saturn I. 10th, and final, 156-inch diameter, solid-propellant rocket motor fired. - . Thiokol-Wasatch Division test fired the 10th, and final, 156-inch diameter, solid-propellant rocket motor (156-8-T). The motor developed one million pounds of thrust during its 118-second firing, which tested a segmented fiberglass case and non-hydroclaved nozzle provided by the Air Force Materials Laboratory (AFML). This test firing completed the Large Solid Rocket Motor Program (Program 623A) begun under Space Systems Division management in 1963.